betterair | Long Island Air Duct Cleaning : Better Air & Quality Inc.
Any building in New York City that lacks proper ventilation can easily become the source of a wide range of dangerous and costly problems. Most of the times, the lack of or improper cleaning of the AC, ventilation and heating unit poses a high risks to people inside the building, since it’s only a matter of time until bacteria, mold and dust begin to form. In any building where there’s little to no ventilation, the chances of these contaminants to spread are high and they can wreak havoc on the health of employees. Most of the times, the building owners have poor excuses for not maintaining the ventilation system properly, while others claim it’s too expensive and time consuming. But as a business owner, you should know that a badly ventilated environment can only negatively affect your employees’ performance. According to the EPA, if the heating and cooling coils of your HVAC gather enough dust and contaminants, not only can these severely reduce its performance, but also pose severe health risks to everyone in the building. As an employer, you probably know that paying sick days is not good for the marketing company in new york. A second issue you should worry about is the amount of electricity faulty or improperly maintained HVAC systems use. The US Department of Energy released a report in which it was clearly stated that a poorly maintained HVAC system uses between 25% and up to 40% more electricity than one in perfect working order. On top of that, since it’s forced to function for longer hours and at higher capacity, its lifespan is greatly reduced. Don’t be surprised if you do have to change it later on, since that’s what happens to most badly maintained HVAC systems: they fail completely. If you want to ensure that won’t be the case with yours and that it’s also not going to cause various respiratory problems to anyone within the building, you’d better get in touch with a certified and professional commercial air duct cleaning service. The professionals at Better Air Quality are fully trained and experienced in HVAC maintenance and therefore it’s recommended you contact them right away if your unit needs urgent repairs. BAQ is very dedicated to making sure the air quality in your commercial or residential building is as best as possible and they also make sure the NADCA standards are always met. As a conscientious building owner, it’s your duty to ensure an excellent indoor air quality for your employees and clients at all times. Serving the New York City area for several decades, Better Air Quality managed to prove itself time and time again and earn the respect and loyalty of thousands of customers thanks to its superior approach and excellent quality services. When using our services, customers receive video evidence (before and after) of their HVAC system so they can easily gauge the hard work we’re doing to ensure the IAQ is safe for everyone inside the building. Not only are we happy to help you, your employees and customers breathe a fresher air and stay safe from respiratory conditions, but we also make a difference on the electricity bill. Better Air Quality is in full compliance with the OSHA and helps protect your health and the environment by using the best EPA registered products. We strongly recommend you to prioritize the maintenance and cleaning of your commercial building’s HVAC system in New York City by hiring a professional service. To find out more about how we can help improve your building’s air quality, make sure to contact us at today at (631) 379-8282. When there is poor ventilation your Queens commercial or residential building, the air quality inside the building is poor which in turn can result in invisible hazards and great losses for commercial buildings. The heating, ventilation and air conditioning unit (HVAC) is mostly hoarded by contaminants such as bacteria, dust and mold. These contaminants, if neglected, spread to the ductwork and therefore are transported to the entire building through the ventilation system. This results in negative view of the building from its occupants and also leads to costly expenditure by property managers in trying to rectify the situation. Constant circulating of dust, mold and pollen can lead to reduced employee productivity, illness, tenant dissatisfaction, and even turn customers and clients away from your business. According to Environmental Protection Agency (EPA), accumulation of contaminants on the heating and cooling coils leads to decrease in HVAC efficiency by up to 21%. It should also be noted that poor air quality is the main reason that many individual miss school and work, as per the American Lung Association, and why commercial air duct cleaning is vital to every business. When there are contaminants in the heating and cooling unit, much more extra energy is required to maintain the desired temperature. This is because the unit has to work past the contaminants before heating or cooling your building. This results to wastage of between 25% and 40% of energy according to research by the United States Department of energy. With this extra work from the system, its life span reduces significantly and therefore maintaining the system becomes very costly. It is evident that air pollutants and contaminants like dust, chemicals mold, pollen and dander cannot be avoided since there are all around us and are released even without our knowledge. It is these simple contaminants that circulate and re-circulate through the HVAC system approximately 5 to 7 times daily and within a short while they accumulate in most parts of the HVAC including the air ducts, return ducts supply ducts, cooling coils, blowers, heat exchangers and even the filters. The risk of accumulated contaminants can be reduced by using the help of certified commercial air duct cleaning services. Better Air Quality (BAQ) technicians have extensive knowledge in proper procedures of controlling pollutants and also the remedies to apply in an already polluted HVAC system. BAQ technicians will inspect the HVAC system and discuss the possible cleaning options with you. They are very mindful of the air quality of the building for the safety of the occupants and therefore they strictly ensure that the standards set by (NADCA) National Air Duct Cleaners Association are met. As a Property developer or building owner, it is your responsibility to regularly have checked the Indoor Air Quality (IAQ) of your premise to avoid the risk of aggravated problems. We have been serving commercial businesses in Queens, NY for many years and have made a reputation for providing first class cleaning services to our clients. When you use the services of BAQ, you get videotaped evidence and certified data that your system is clean and you are protected in case of any health issue. This helps in sustaining good air quality in your premises with minimal expenses. Also plenty of energy is saved and your system works efficiently ensuring maximum performance and production. Better Air Quality complies with OSHA (Occupational Safety and Health Administration) standards for safety and is a member of the NADCA (National Air Duct Cleaners Association). BAQ uses only the best EPA (Environmental Protection Agency) registered products to protect human health and the environment. Make it a priority to have your ductwork in your commercial building inspected on a regular basis. Choose the best air duct cleaning company in Queens, NY. Call us at (631) 379-8282 for more information. 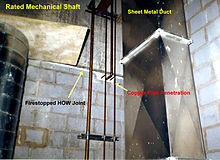 Fire-resistance rated mechanical shaft with HVAC sheet metal ducting and copper piping, as well as “HOW” (Head-Of-Wall) joint between top of concrete block wall and underside of concrete slab, firestopped with ceramic fibre-based firestop caulking on top of rockwool. Ducts are used in heating, ventilation, and air conditioning (HVAC) to deliver and remove air. These needed airflows include, for example, supply air, return air, and exhaust air. Ducts also deliver, most commonly as part of the supply air, ventilation air. As such, air ducts are one method of ensuring acceptable indoor air quality as well as thermal comfort. Galvanized mild steel is the standard and most common material used in fabricating ductwork. For insulation purposes, metal ducts are typically lined with faced fiber glass blanket (duct liner) or wrapped externally with fiber glass blankets (duct wrap). Traditionally, air ductwork is made of sheet metal which is installed first and then lagged with insulation as a secondary operation. Ductwork manufactured from rigid insulation panels does not need any further insulation and is installed in a single fix. Light weight and installation speed are among the features of preinsulated aluminium ductwork, also custom or special shapes of ducts can be easily fabricated in the shop or on site. The ductwork construction starts with the tracing of the duct outline onto the aluminium preinsulated panel, then the parts are typically cut at 45 degree, bent if required to obtain the different fittings (i.e. elbows, tapers) and finally assembled with glue. Aluminium tape is applied to all seams where the external surface of the aluminium foil has been cut. A variety of flanges are available to suit various installation requirements. All internal joints are sealed with sealant. Among the various types of rigid polyurethane foam panels available, the foaming process of a new water formulated panel is obtained through the use of water and CO2 instead of CFC, HCFC, HFC and HC gasses. Most manufacturers of rigid polyurethane foam panels use pentane as foaming agent instead of the CFC, HCFC, HFC and HC gasses, so do manufacturers of rigid phenolic foam panels. A rigid phenolic insulation ductwork system is listed as a class 1 air duct to UL 181 Standard for Safety. Both polyurethane foam panels and phenolic foam panels are manufactured with factory applied aluminium facings on both sides. The thickness of the aluminium foil can vary from 25 micrometres for indoor use to 200 micrometres for external use or for higher mechanical characteristics. The finish for external ductwork exposed to the weather can be an aluminum or aluminium / zinc alloy coated sheet steel, a multilayer laminate, a fibre reinforced polymer or other waterproof coating. Fiberglass duct board panels provide built-in thermal insulation and the interior surface absorbs sound, helping to provide quiet operation of the HVAC system. The duct board is formed by sliding a specially-designed knife along the board using a straightedge as a guide; the knife automatically trims out a “valley” with 45° sides; the valley does not quite penetrate the entire depth of the duct board, providing a thin section that acts as a hinge. The duct board can then be folded along the valleys to produce 90° folds, making the rectangular duct shape in the fabricator’s desired size. The duct is then closed with outward-clinching staples and special aluminum or similar ‘metal-backed’ tape. Commonly available duct tape should not be used on air ducts, metal, fiberglass, or otherwise, that are intended for long-term use; the adhesive on so called ‘duct tape’ dries and releases with time, further the ‘duct tapes’ do not meet the required UL standards for fire resistance. Flexible ducts, known as flex, have a variety of configurations, but for HVAC applications, they are typically flexible plastic over a metal wire coil to make round, flexible duct. In the United States, the insulation is usually glass wool, but other markets such as Australia, use both polyester fibre and glass wool for thermal insulation. A protective layer surrounds the insulation, and is usually composed of polyethylene or metalised PET. Flexible duct is very convenient for attaching supply air outlets to the rigid ductwork. However, the pressure loss through flex is higher than for most other types of ducts. As such, designers and installers attempt to keep their installed lengths (runs) short, e.g., less than 15 feet or so, and to minimize turns. Kinks in flex must be avoided. Some flexible duct markets prefer to avoid using flexible duct on the return air portions of HVAC systems, however flexible duct can tolerate moderate negative pressures – the UL181 test requires a negative pressure of 200 Pa. Fabric ducting, Usually made of special polyester material, fabric ducts can provide air to a space more effectively than a conventional exposed duct system. Fabric duct is a misnomer as “fabric duct” is actually an “air distribution device” and is not intended as a conduit (duct) for conditioned air. However, as it often replaces hard or metal ductwork it is easy to perceive it simply as duct. Fabric air dispersion systems, is the more definitive name. As they may be manufactured with venting or orifices for even air distribution along any length of the system, they commonly will provide a more even distribution and blending of the conditioned air in a given space. As “fabric duct” is used for air distribution, textile ducts are not rated for nor should they be used in ceilings or concealed attic spaces. Applications for fabric duct in raise floor applications; however, are available. Depending on the manufacturer, “fabric duct” is available in standard and custom colours with options for silk screening or other forms of appliques. “Fabric duct”, depending on the manufacturer, may be available in air permeable(porous) or non-porous fabric. As a benchmark, a designer may make the determination of which fabric is more applicable by asking the question if the application would require insulated metal duct? If metal duct would be insulated in a given application or installation, air permeable fabric would be recommended as it will not commonly create condensation on its surface and can therefore be used where air is to be supplied below the dew point. Again; depending on the material and manufacturer, material that eliminates moisture may also be healthier and may also be provided with an active anti-microbial agent to inhibit bacteria growth. Porous material also tends to require less maintenance as it repels dust and other airborne contaminants. Besides the ducts themselves, complete ducting systems contain many other components. A duct system often begins at an air handler. The blowers in the air handlers can create substantial vibration and the large area of the duct system would transmit this noise and vibration to the inhabitants of the building. To avoid this, vibration isolators (flexible sections) are normally inserted into the duct immediately before and after the air handler. The rubberized canvas-like material of these sections allow the air handler to vibrate without transmitting much vibration to the attached ducts. The same flexible section can reduce the “bang” that can occur when the blower engages and positive air pressure is introduced to the ductwork. Downstream of the air handler, the supply air trunk duct will commonly fork, providing air to many individual air outlets such as diffusers, grilles, and registers. When the system is designed with a main duct branching into many subsidiary branch ducts, fittings called take-offs allow a small portion of the flow in the main duct to be diverted into each branch duct. Take-offs may be fitted into round or rectangular openings cut into the wall of the main duct. The take-off commonly has many small metal tabs that are then bent to retain the take-off on the main duct; round versions are called spin-in fittings. Other take-off designs use a snap-in attachment method, sometimes coupled with an adhesive foam gasket to provide improved sealing. The outlet of the take-off then connects to the rectangular, oval, or round branch duct. Ducts, especially in homes, must often allow air to travel vertically within relatively thin walls. These vertical ducts are called stacks and are formed with either very wide and relatively thin rectangular sections or oval sections. At the bottom of the stack, a stack boot provides a transition from an ordinary large round or rectangular duct to the thin wall-mounted duct. At the top, a stack head can provide a transition back to ordinary ducting while a register head allows the transition to a wall-mounted air register. Ducting systems must often provide a method of adjusting the volume of air flow to various parts of the system. VCDs (Volume Control Dampers – Not To Be confused with Smoke/Fire Dampers) provide this function. Besides the regulation provided at the registers or diffusers that spread air into individual rooms, dampers can be fitted within the ducts themselves. These dampers may be manual or automatic. Zone dampers provide automatic control in simple systems while VAVs allow control in sophisticated systems. Smoke and Fire dampers are found in ductwork, where the duct passes through a firewall or firecurtain. Smoke dampers are automated with the use of a mechanical motor often referred to as an Actuator. A probe connected to the motor is installed in the run of duct, and detects smoke within the duct system which has been extracted from a room, or which is being supplied from the AHU (Air Handling Unit) or elsewhere within the run. Once smoke is detected within the duct, the Actuator triggers the motor release and the smoke damper will automatically close until manually re-opened. You will also find Fire dampers in the same places as smoke dampers, depending on the application of the area after the firewall. Unlike smoke dampers, they are not triggered by any electrical system, which is perfect in the event of an electrical failure where the Smoke dampers would fail to close. Fire dampers may be mounted in either horizontal or vertical configurations. Vertically mounted fire dampers are gravity operated while horizontal fire dampers are spring powered. In either case, a fire damper’s most important feature is known as a fusible link. A fusible link is a piece of metal that will fail at a specified temperature allowing the damper to open under gravity or spring power, effectively sealing the duct, containing the fire, and denying it the necessary air to burn. Turning vanes are installed inside of ductwork at changes of direction in order to minimise turbulence and resistance to smooth air flow. Plenums are the central distribution and collection units for an HVAC system. The return plenum carries the air from several large return grills (vents) or bell mouths to a central air handler. The supply plenum directs air from the central unit to the rooms which the system is designed to heat or cool. While single-zone constant air volume systems typically don’t have them, other types of air distribution systems often have terminal units in the branch ducts. Usually there is one terminal unit per thermal zone. Some types of terminal units are VAV ‘boxes’ of either single or dual duct, fan-powered mixing boxes of either parallel or series arrangement, and induction terminal units. Terminal units may also include either, or both, a heating or cooling coil. ‘Air terminals’ are the supply air outlets and ‘return’ or ‘exhaust air inlets’. For supply, diffusers are most common, but grilles, and for very small HVAC systems such as in residences, ‘registers’ are also used widely. Return or ‘exhaust grilles’ are used primarily for appearance reasons, but some also incorporate an air filter and are known as ‘filter returns’. The position of the U.S. Environmental Protection Agency (EPA) is that “If no one in your household suffers from allergies or unexplained symptoms or illnesses and if, after a visual inspection of the inside of the ducts, you see no indication that your air ducts are contaminated with large deposits of dust or mold (no musty odor or visible mold growth), having your air ducts cleaned is probably unnecessary.” A thorough duct cleaning done by a professional duct cleaner will remove dust and debris-pet hair, paper clips, children’s toys and whatever else might collect inside. Ideally, the interior surface will be shiny and bright after cleaning. Insulated fiber glass duct liner and duct board are able to be cleaned with special non-metallic bristles. Duct cleaning may be justifiable to you personally for that very reason: you may not want to have your house air circulated through a duct passage that is not as clean as the rest of the house. However, duct cleaning will not usually change the quality of the air you breathe, nor will it significantly affect airflows or heating costs. After cleaning, there’s still left over dust floating around the house that you can see. Rooms in your house have little or no air flow coming from the vents. You’re experiencing signs of sickness: fatigue, headache, sneezing, stuffy or running nose, irritability, nausea, dry or burning sensation in eyes, nose and throat. Before sealing duct work it is imperative to ensure the total external static pressure of your duct work and equipment will fall within your equipment manufacturer’s specifications. If not, higher energy usage and reduced equipment performance may be expected. CoolingComponents Are both sides of the cooling coil visibly clean? AccessDoors Are newly installed access doors in sheet metal ducts attached with more than just duct tape (e.g., screws, rivets, mastic, etc.)? With the system running, is air leakage through access doors orcovers very slight or non-existent? SystemOperation Does the system function properly in both the heating and cooling modes after cleaning? NADCA, and NAIMA all recommend the replacement of wet or moldy fiber glass duct material. to encapsulate the duct surfaces may be appropriate include the repair of damaged fiber glass insulation or when combating fire damage within ducts. Sealants should never be used on wet duct liner, to cover actively growing mold, or to cover debris in the ducts, and should only be applied after cleaning according to NADCA or other appropriate guidelines or standards. 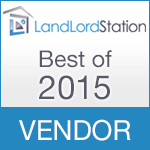 Better Air Quality Inc. offers twenty years of experience. Located in New York, Better Air Quality has managed to engrave a distinct position for itself in the market. BAQ administrates air duct cleaning services with superiority in the Queens New York area. With a team of professionals, the BAQ staff complies with industry guidelines related to air duct cleaning to ensure safety for all of their clients. Air duct cleaning is the best way to increase the quality of air you breathe. It reduces the levels of dirt, debris, mold, pollen, dust mites and reduces your utility bills by improving the efficiency of your HVAC system. Better Air Quality will clean grilles and diffusers, supply and return air ducts, heat exchangers heating and cooling coils, fan motor and fan housing, condensation drain pans (drip pans) and the air handling unit housing. Queens is the easternmost of the five boroughs of New York City, the largest in area and the second-largest in population. The borough of Queens has been coterminous with Queens County since 1899. The county is now the second most populous county in New York State (behind Kings County), as well as the fourth-most densely populated county in the United States. Queens, as well as neighboring borough Brooklyn, sits on the west end of geographic Long Island. Queens is the most ethnically diverse urban area in the world with a population of over 2.2 million, 48% of whom are foreign-born, representing over 100 different nations and speaking over 138 different languages. If each New York City borough were an independent city, Queens would be America’s fourth most populous city, after Los Angeles, Chicago, and Brooklyn. Queens has the second-largest and most diversified economy of all the five boroughs of New York City. Queens is home to two of the three major New York City area airports (and both major airports in New York City proper), JFK International Airport and LaGuardia Airport. These airports are among the busiest in the world, causing the airspace above Queens to be the most congested in the country. Attractions in Queens include Flushing Meadows Park—home to the New York Mets baseball team and the US Open tennis tournament—Kaufman Astoria Studios, Silvercup Studios, and Aqueduct Racetrack. Queens was established in 1683 as one of the original 12 counties of New York and was named for the Portuguese princess Catherine of Braganza (1638–1705), who was at the time queen of England, Scotland and Ireland. Better Air Quality Inc. (BAQ) is a full-service HVAC air duct cleaning company that has been in business for over 20 years, providing businesses and residences quality air duct sanitation services. With excellence in the Brooklyn New York area, BAQ has managed to carve a distinct niche for itself in the market. To insure safety to our clients, BAQ’s team members are thoroughly educated to strict industry guidelines related to air duct cleaning. Various parts of heating and cooling systems of forced air systems require air duct sanitation maintenance to insure the quality of the air you breathe. Sanitation of different components such as supply and return air ducts, heating and cooling coils, grilles and diffusers, fan motor and fan house, drip pans, and the air handling unit housing, are an important part of this process. Air duct sanitation reduces the levels of mold, pollen, dust mites, dirt and debris and improves the function and efficiency of your HVAC system. Brooklyn is the most populous of New York City’s five boroughs, with approximately 2.5 million residents, and the second-largest in area. Since 1896, Brooklyn has had the same boundaries as Kings County, which is now the most populous county in New York State and the second-most densely populated county in the United States, after New York County (Manhattan). It is also the westernmost county on Long Island. Today, if it were an independent city, Brooklyn would rank as the fourth most populous city in the U.S., behind only the other boroughs of New York City combined, Los Angeles, and Chicago. Brooklyn was an independent city until January 1, 1898 when, according to the Charter of “Greater New York”, Brooklyn was consolidated with the other boroughs to form the modern “City of New York”. It continues to maintain a distinct culture. Many Brooklyn neighborhoods are ethnic enclaves where particular ethnic groups and cultures predominate. Brooklyn’s official motto is Eendraght Maeckt Maght. Written in the (early modern spelling of the) Dutch language, it is inspired by the motto of the United Dutch Provinces (currently the official motto of Belgium) and translated “Unity makes strength”. The motto is displayed on the borough seal and flag, which also feature a young robed woman bearing fasces, a traditional emblem of Republicanism. Brooklyn’s official colors are blue and gold.